Angela Merkel has been sworn in for a fourth term as German chancellor, after months of political wrangling that left her weakened. Germany`s parliament earlier approved her re-election by 364 votes to 315. Mrs Merkel has vowed to get to work quickly after the longest period of coalition-building in post-war Germany. It is nearly six months since the election. Mrs Merkel`s conservative CDU/CSU bloc had its worst result in almost 70 years. But she finally secured a coalition deal with the Social Democrats (SPD) earlier this month following a painful stretch of political deadlock. It cost her several key posts - including finance and foreign minister - in Germany`s new cabinet. Read more After parliament confirmed Mrs Merkel`s reappointment on Wednesday, she told MPs: "I accept the vote.
" Her scientist husband, Joachim Sauer, and her 89-year-old mother Herlind Kasner were among the well-wishers in the Bundestag`s lower house. But analysts said the vote was a humbling start as only 364 MPs backed her appointment, when her conservative bloc and the SPDs have 399. 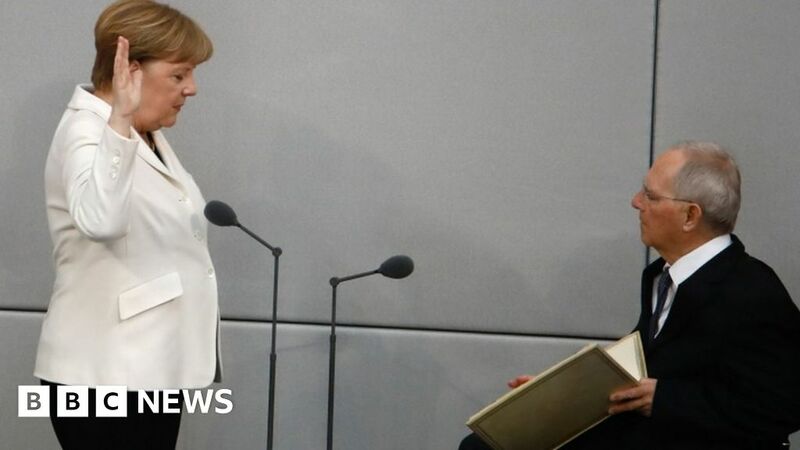 Mrs Merkel was formally appointed by President Frank-Walter Steinmeier before taking the oath of office. Mainstream parties suffered in September`s election amid a surge by right-wing populists. The anti-immigrant party, Alternative for Germany (AfD), entered the federal parliament for the first time with just over 12% of the vote, and now makes up the largest opposition group.